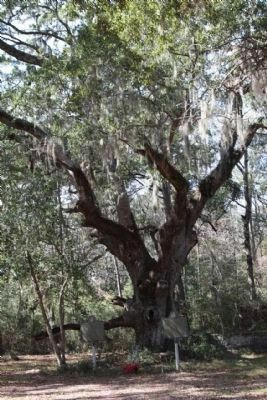 In this plot under the “Great Oak at Mallow Plantation,” Captain William McIntosh, father of the Indian chief, General William McIntosh, was buried in 1794. 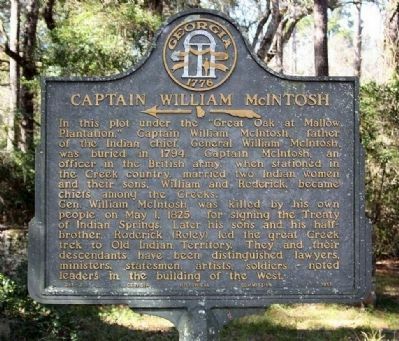 Captain McIntosh, an officer in the British army, when stationed in the Creek country, married two Indian women and their sons, William and Roderick, became chiefs among the Creeks. Gen. William McIntosh was killed by his own people on May 1, 1825, for signing the Treaty of Indian Springs. Later his sons and his half-brother Roderick (Roley) led the great Creek trek to Old Indian Territory. They and their descendants have been distinguished lawyers, ministers, statesmen, artists, soldiers – noted leaders in the building of the West. Avenue), on the right when traveling south. Touch for map. 2.8 miles E of US 17, 2.2 mi N of Eulonia. Some street signs call this Fairhope Rd, Foir Hoppe Road and Cooke Avenue. Marker is in this post office area: Crescent GA 31304, United States of America. Touch for directions. Other nearby markers. 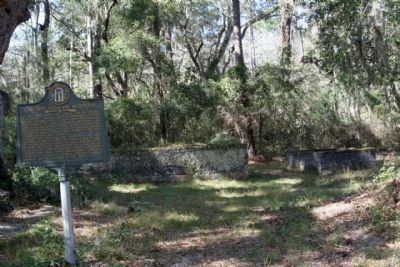 At least 8 other markers are within 4 miles of this marker, measured as the crow flies. Colonel John McIntosh (here, next to this marker); Mallow Plantation (about 700 feet away, measured in a direct line); Old Belleville or Troup Cemetery (approx. 1.1 miles away); Baisden's Bluff Academy (approx. 2.6 miles away); John Houstoun McIntosh (approx. 2.7 miles away); Rice Hope (approx. 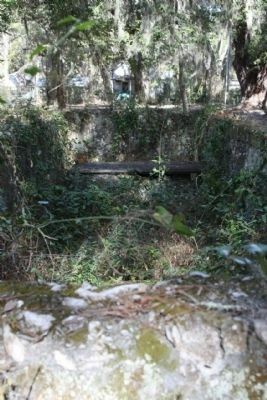 2.7 miles away); Old Court House at Sapelo Bridge (approx. 3 miles away); Sutherland's Bluff (approx. 3.3 miles away). Touch for a list and map of all markers in Pine Harbor. More. 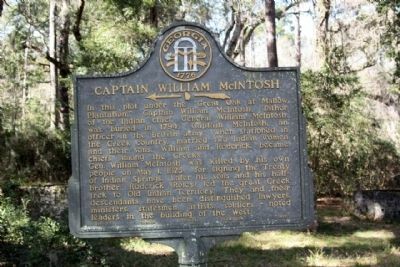 Search the internet for Captain William McIntosh. Credits. This page was last revised on June 16, 2016. This page originally submitted on February 16, 2009, by Mike Stroud of Bluffton, South Carolina. This page has been viewed 3,124 times since then and 32 times this year. 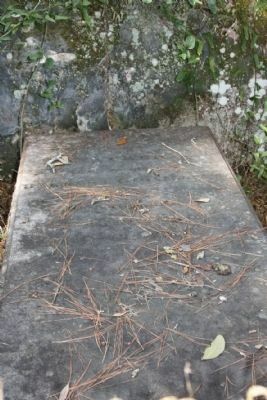 Photos: 1. submitted on April 2, 2011, by Mike Stroud of Bluffton, South Carolina. 2, 3, 4, 5, 6. submitted on February 16, 2009, by Mike Stroud of Bluffton, South Carolina. • Kevin W. was the editor who published this page.